Question : Please share your best ways to get web traffic to your blog/site. 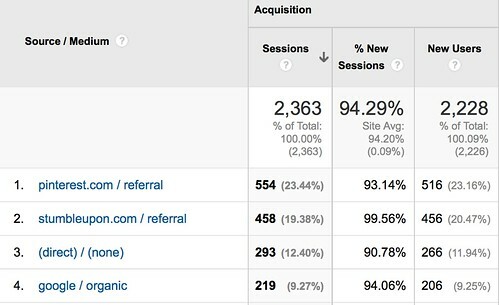 So far my biggest success with driving traffic has been StumbleUpon. When anything goes hot on StumbleUpon, you get several months of low-converting (still good) traffic. The very first article that I felt that with was this one. When I was writing it, I had no idea what StumbleUpon really was, then I was a huge spike in traffic and discovered the platform. The traffic from it is still coming, even though the article is many years old. As you can see from comments, many of stumblers actually interact. I think it really comes down to having something to say on your topic that has your personality on it. Regardless of the niche that you enter you are more than likely going to come across a website that has already done it but don’t be put off by this. Try to create content with your personality, it will surely come off unique in some way and visitors will enjoy reading YOUR views on the subject. I pin my own blog posts and all the other pins are generated almost organically. I am also member of a couple of active Pinterest shared boards where several contributors can add images to one board. I am getting a lot of referrals from those group boards. I would recommend anyone to go ahead and find relevant group boards on Pinterest. I guess that also depends on the niche: Food, DIY, stay-at-home moms, kids – all these are doing GREAT on Pinterest and very easily. For me one of the best ways that give long term results is search engine optimization. Most bloggers focus a lot on creating and adding content to their blog but often ignores the SEO part which is rankings. Of course you can optimize the blog post with proper titles, good keyword density etc. but to rank for any targetted keyword you need back links. This is why there is often gaps between posts in my personal blog. Whenever I write an article I tried to get it to rank for that targetted keyword. This way all the effort I put into creating the article will be justified because of the long term traffic potential. I have found one of the best ways to get traffic to my education blog is through forums. I knew the best forum in my niche and had already been active on it before I started my own website and blog, so it wasn’t hard to continue participating there. I use my signature to point to specific pages or posts on my site. I change my signature regularly to highlight whatever I want them to see and then I just participate in discussions and try to provide valuable insight. I do not promote my website at all – excpet in my signature, but now I am thrilled to see that my website regularly pops up in other discussions on the forum and so my traffic from this source just keeps on growing. Two underutilized sites that can generate quality traffic are: Slideshare and Medium. I have found that both writers and readers of those sites seem to truly care about the information being shared and the topic being discussed there. Thus, you will get more quality and qualified traffic than quantity. Both sites are free to use, have simple interfaces and also conveniently provide simple built-in traffic stat trackers. However, the key to getting these sites to work for you is to clearly indicate what action you want your readers to take: whether it is to subscribe, click on a link, download an ebook, etc. These calls-to-action are free form, so it is up to you to determine where to put them, what links to use, and how to write the copy to be most effective. It has to be Search Engine Optimization. What other marketing strategies allow you to build up a steady stream of traffic that grows exponentially the more effort you put into it? Done right that traffic is highly relevant, searching for specific keywords that you can benefit from. Sure it takes a lot of time and effort to build up that SEO strength, but the benefits can last a significant length of time – pretty much until Google changes up their algorithm drastically. Even then, you still have a solid base to climb back up the rankings. When your site has that SEO strength you can also easily rank for all kinds of other new keywords simply by posting new content. My favorite way to drive traffic is through blog tribes. Not only do you create solid connections with amazing bloggers throughout the world, it is also a goldmine for networking with other bloggers in your niche. Additionally, blog tribes increase your social media reach. Over the years, I have generated tens of thousands of visits to my site through various blog tribes. Finally on Triberr, I have build solid relationships with many great bloggers in my niche. Through these relationships I guest blogged on JeffBullas.Com, MichaelQTodd.Com, and SteamFeed.Com. The blog posts that I wrote on Jeff Bullas’s site alone have generated a few thousand dollars in business. Thanks a lot to the aweome participants of this interview. And I hope you have leaned something new from reading these experiences! Can you share your best way to get traffic? 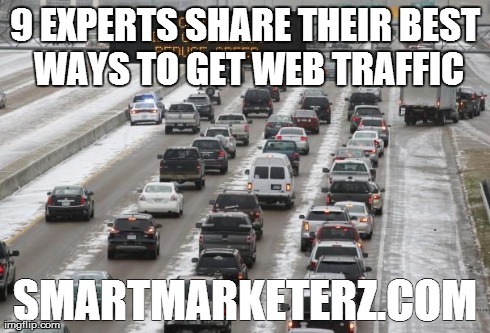 Hi Erik, I love that all of these bloggers mentioned different ways of getting traffic. I used to use StumbleUpon until I realized I had a very high bounce rate from it. I wonder if it’s changed since. Something I may revisit. I have found recently that a group interview really helped me drive traffic to a recent blog post on comment systems. It was a quite a debate among the readers leaving comments. I hope to do more of those in the future like this post too. Triberr is also a favorite of mine. I would not get the # of tweets with this source. I cannot imagine blogging with the use of Triberr. Thanks for the nice roundup and introduction of bloggers I haven’t met before Erik. Have a great day! This kind of posts are really useful, because bloggers share their experiences. And we can learn a lot! I confirm you that Triberr is my favorite tool to get traffic from. And we can find the greatest blog posts to share there. Not to mention, we can build interesting new connections. Thanks for taking the time to read and comment, Lisa. I look forward to read your next interview post! I have a little clash with your words I will tell them experts, they are like treasure boxes for us who shared their treasure gathering tricks with us. I have no words rather then these. Thanks Erik………thanks a lot. Glad this article helped you, Sakib! Yes indeed, surprisingly I get the maximum traffic from Pinterest, followed by G+, FB, and Twitter. Stumbleupon is something new that’s started working for me, but it depends a lot on the timezone you post your content and also under what category. It seems that StumbleUpon and Pinterest are two sources of traffic most people are not aware of, or not using properly. While Facebook, Twitter or Google+ are more popular and the most used. It’s great to hear the experiences of different bloggers, as we can learn a lot! This is a nice article, however I felt that this(traffic) will happen only when you have right content, same stuff is there on several website which is on my website, so ask myself why people will come to my website. I can think only few answers, * My website is neat (or will be) and look professional, * I will have stuff which people can directly use, and lastly I will market it better and it will there in front of people. Now @seosmarty blog I liked and found, that few other marketers whom I was following are following her and utilizing her knowledge (though none of them mentioned that they are using her knowledge). I am attending #vcbuzz chats to learn. Lastly I hope I earn from my blogs and then I will be able to invest more into buying pluggins,packages, and themes. Right Now I am just trying and traffic, I believe will come with time and content not just overnight. While I agree with you, we must write good content, in order to have visitors over time, I think that there are still many SPAM sites or even blogs with fair content, which are ranking very well and receive steady organic traffic. Sometimes it’s a matter of SEO. I carefully ran through what the gurus had to say and interestingly one thing is clear, being active on social media brings in lots of traffic. I am now from today going to be very much active on pinterest as well. Thanks for sharing with us these insights from these great bloggers. Glad to know you learned some new tips today, Emmanuel. Thank You for building such an awesome new platform to help bloggers create great content collaborating together. All spot on advice here. I totally vibe with Andy. Using tribes – especially Triberr – has changed my blogging trajectory over night. My old blog gained some traction but once I put my new blog on Triberr things took off fast. The key is participation. If you share people’s stuff, and work to promote them daily, and post helpful, thoughtful comments to their blogs, and also leave a few lines on the post itself through the tribe, you’re golden. I’d add that writing a series of outreach posts totally rocks. One of mine nailed down 3,800 Flares and generated 93 comments. Thanks Erik for all you do. as for every of your online marketing activities. it’s such an awesome way to get traffic, social shares and new connections! I am heading to your blog right now! Among them, Nishadha a Freelance Digital Marketer has an opinion that coincided mine. With SEO or Search Engine Optimization, blogging won’t go insane. Blogging without SEO is a huge mistake that many did. It’s not too late to learn about SEO and enroll in a university online to widen our understanding and leverage our traffic. Effort in creating an article is much more effective by doing so. We want to produce the best juice out of our effort, right? We should consider SEO while producing content, but we must also put readers first of everything else! I signed up for MyBlogU a couple of weeks ago but haven’t really had a chance to take a good look at it yet. It looks like its a great place to get some feedback and some opinions on things. Triberr has to be the most awesome traffic generator ever. Twitter’s one of my biggest sources of traffic from social media and Triberr certainly helps an awful lot with that. I’ve been experimenting with StumbleUpon again recently too and have been sharing any posts I comment over there as well as some of my own. It’s too early to say how’s that’s going but I know in the past, it can really help to generate some big interest in a post. glad you are member of MyBlogU too. (or even create your first one). I agree with you : Triberr rocks! I’ve been a member since the very beginning of the project of Dino and Dan. I got so many benefits from being an active member. As for StumbleUpon, it’s long time I don’t submit any posts. I’ve got some traffic (and still receiving, by the way). I need to try to add some more content and see how it goes. Thanks for sharing your experience, Tim. There were some great ideas from each blogger. I really liked the idea of blog tribes by Andy. It’s a strategy that I’ve been employing with a lot of success. I have really thought about this and have come to the conclusion that good online networking is the key if done among influential bloggers. I suppose that means I have to earn the right to be one with them by influencing and persuading them that my content is worth it. I am figuring out how to build my community of raving fans that will take the mantle and help me grow as I work to help them grow. I think when done right, Google will do its part. So far, so true. I was really surprised to read about Stumbleupon for Ann Smarty. I have never gotten any traction. Obviously I need to do some more reading and researching because my inclination is that I’m not using the tool properly. Great post Erik. I am a member of MyBlogU but I just haven’t taken the time yet to figure it out. Looks like that time is coming quickly. I hope you have a great close to your week! Glad to know you share with the people interviewed some methods of gaining traffic. You are doing such a fantastic job with your site, your online activities, and most of all, the online networking. Congratulations and I am glad to have you in my circles. You should take a look at MyblogU, it could be another way to reach new audience for you. and have a great rest of this week, Don! I used Stumbleupon but it landed up in huge bounce rates, one needs to make sure the article is best for STU users. Organic searches are favorite to many, do it great once and reap the benefits for long, but it is uncertain as others are trying to pull you down. Social traffic are the best, I am now inclined to join some pinterest boards, to have nice traffic. There is a good saying, together we go much longer than we might individually. Maybe that’s why a group interview tends to do much better in traffic referrals. I think bounce rate is the downside of receiving much traffic from StumbleUpon. Users keep surfing the net very fast via SU toolbar. Well, every bloggers want some organic traffic! But it is so unstable! Difficult to have always the same over time, with the Google updates. I agree, I love social media traffic too! I am very happy that all of these blogger share thier view about getting Traffic from diffrent sources. As I read in above comment. these types of post are very helpful for newbie in blogging because we can also get more and more traffic from these sources. If we follow to these bloggers. In my niche, Million are competitor but I am getting lots of traffic. and 95% of my traffic from Google search engine. Glad to have you helped, Areesha. Thanks for sharing your veiws here. Most of my traffic is from social media facebook,twitter never knew i can as well do the same with pinterest and stumbleupon . Thanks for this wornderful post. StumbleUpon still works great for me, but in the past it was bigger. I get some hits from Pinterest, but I guess I need to invest more time. Thanks for visiting and commenting, Samuel. I am new in blogging and was searching way to get traffic to my site, finally found your post which is really very nice. Thanks for sharing such a great post with us. Glad you enjoyed the tips in this post. Good luck with your new blog, Pallavi. Glad you liked the post, Dsmla! The role of SEO plays an important role in making your blogs popular. You must have basic knowledge of SEO. SEO will help you to connect your blog with more and more sites and hence more people will get attracted towards your blog. You must target to have large number of quality back links to your blog. First learn SEO, then learn to write for your readers. Glad you liked the post, Akshay. How important is your keywords on the blog, to get traffic from the search engines? choosing the right keywords is the first most important step to get organic traffic. Good to hear that, Manish! SEO is an important factor, Shawn. But there are many other important keys in the blogging game! Nor just for links or for getting traffic, but blog commenting is great most of all for building relationships around blogosphere, Jesse. I wouldn’t believe how much valuable this post is for me. Because It contains such kind of information which is based on real experiences. I would definitely follow these suggestion ways to drive traffic. It was really worth reading your article as these ways can really helpful if we use it for increasing our website traffic. Great. amazing post, Thanks for sharing the way to get traffic.